30W Electronic switching power supply with an inline rocker switch on the DC cord. Perfect upgrade for HTP systems adding up to six 24" light-bars. Can also run one roll of HTPR or SCR3 ribbon products. For ease of connectivity to pigtail wires purchase of CON-DCF5x2.1TB is recommended. Need to cut off plug and strip wires for hard-wired connections. 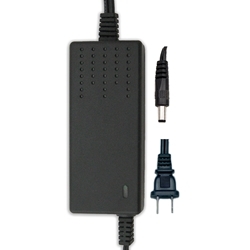 While 12VDC supplies are included with many computer devices, few of the computer power supplies are rated for 2.5A, nor do they have inline switches.